Spurred on by animal lovers and curious passersby, wild turkeys are expanding into urban neighborhoods and taking over areas of the East Bay hills. And there's nothing we can do about it. 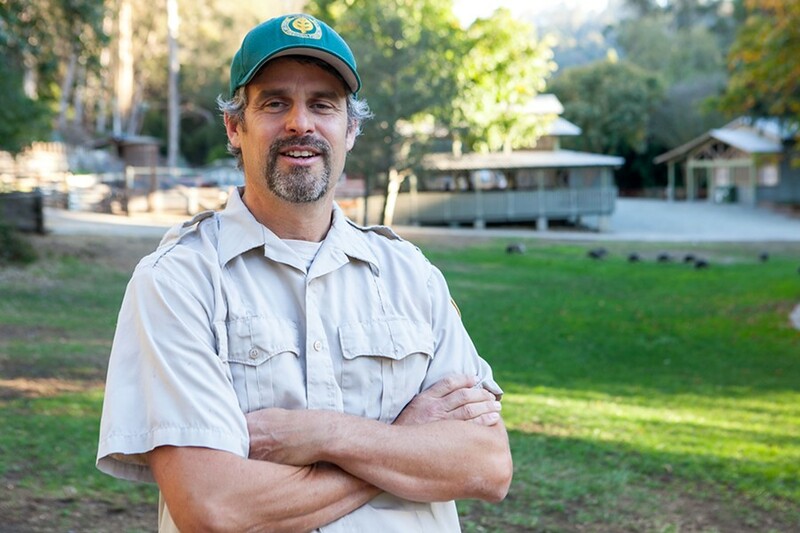 Bert Johnson Anthony Fisher, an East Bay Regional Parks naturalist, said people have been chased by turkeys. Bert Johnson The wild turkeys at Tilden Park's Little Farm area show no fear of visitors. 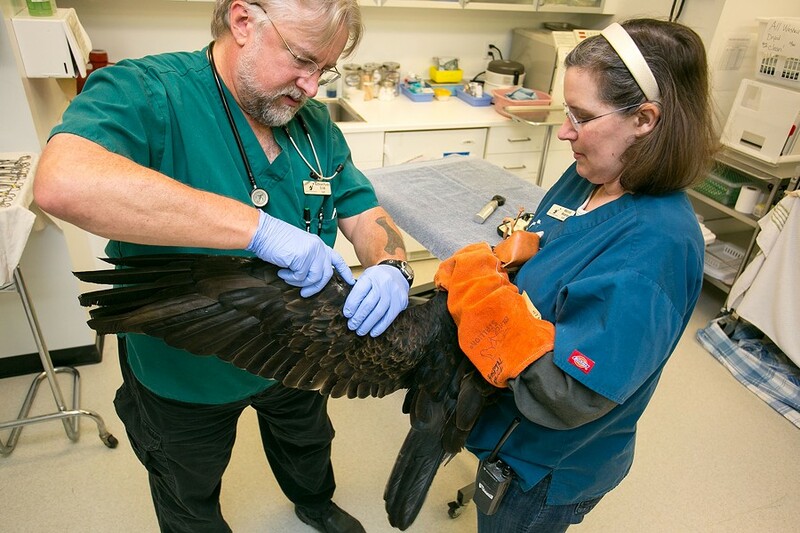 Bert Johnson Guthrum Purdin (left), director of veterinary services at the Lindsay Wildlife Museum, cares for a wild bird. Fifteen deep, the turkeys roamed the intersection with no regard for where the sidewalk began or ended. An SUV pulled up to the stop sign and its driver paused, eyeing the unusual posse. The two older males shepherding the group through the hilly Montclair neighborhood puffed their chests, and the SUV continued on. Another car came roaring around the bend, swerving just enough to miss them. The gang paid no mind, just as they paid no mind to the dog barking at them from the nearby deck or to my presence a few yards away where I watched them from the side of the road. They owned these streets. The turkeys fanned their tail feathers and sauntered off, pecking at bits of leaves and sampling the faint remains of some roadkill. When I heard tale of turkeys strutting around suburban Walnut Creek in the early 2000s, I hardly believed it. And when a gang — which, yes, is a technical name for a group of turkeys — appeared near my childhood home in the Forestland neighborhood of the Oakland hills a few years ago, we tossed stale cereal on the ground outside the kitchen window in hopes of seeing fuzzy, speckled poults follow their mother to peck the crumbs from the dirt. Now when I see the turkeys, I yell. I run at them. I throw rocks in their general direction (I don't have the heart to take better aim and don't really want to hurt them). In return, they stare at me, glassy-eyed, gobbling softly, more annoyed than frightened, before ambling away. Now, their feathers dot my family's property as freely as the pine needles from the trees they roost in. It's clear that, like me, many East Bay residents no longer view wild turkeys as kindly creatures. They tear up gardens, scratch the paint on shiny cars, raid outdoor pet food bowls, and leave trails of cement-like mounds of poop wherever they go. A few years ago, they were spotted chasing Segway riders near Lawrence Berkeley National Lab. 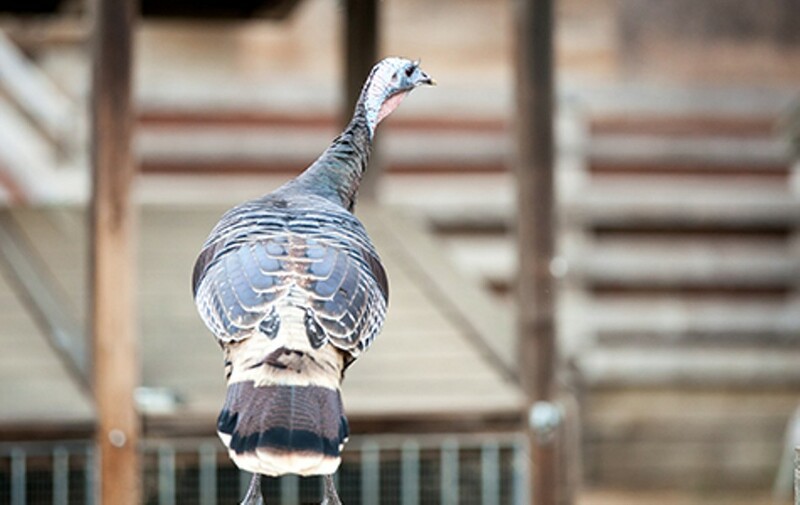 During mating season, a notoriously dramatic time for turkeys, they have leapt on visitors in Tilden Park. "People have been confronted or chased by the turkeys," said Anthony Fisher, an East Bay Regional Park District naturalist. "It's mostly for show: making noise, flapping wings, and so forth to protect offspring. But there's been physical contact." Turkeys are roosting in Albany trees, at East Bay golf courses, and at Oakland's Mountain View Cemetery. Oakland resident James Stevens said a tom charged people near his home and had stand-offs with his dog. "Most of the time," he said, "it would just stare at you like a real creep." They also pose a serious threat on roadways, which, as you may have surmised, they don't pay much attention to. A Benicia bicyclist crashed and died after a flock darted into his path two years ago, and a 2011 US Department of Agriculture study found turkeys to be the eleventh most hazardous species to aircraft. According to data compiled about a decade ago, California was home to about a quarter-million turkeys. Although the state's population numbers haven't been officially updated, there are certainly more turkeys than that now, said Scott Gardner, an environmental scientist for the California Department of Fish and Wildlife. Indeed, as turkeys grow in numbers, they have expanded their terrain, wandering from the wooded hills they typically prefer to more urban neighborhoods in Oakland, Berkeley, Albany, El Cerrito, and Richmond, chasing and attacking residents and leaving behind huge mounds of feces. And not only is there not much we can do about it, but we have no one to blame for the turkey invasion but ourselves. If wild turkeys evoke images in your mind of the sweet hand-traced decorations that litter kindergarten classrooms every autumn or the puffy, docile birds that end up on your plate for Thanksgiving, so stupid they are falsely rumored to drown in the rain, then think again. 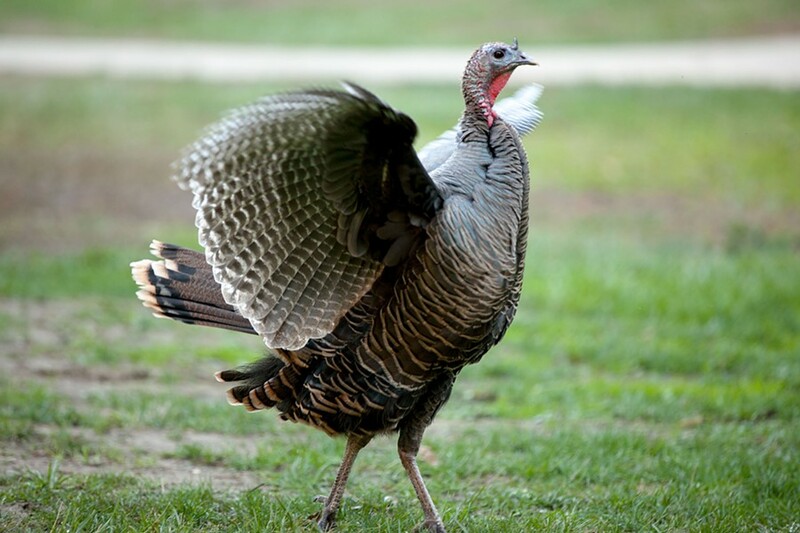 Mature wild turkeys top out at around twenty pounds in weight and four feet in height. They run at the same speed as Olympic sprinter Usain Bolt and, unlike their too-plump domesticated brethren, can fly at speeds more than twice that. They have excellent vision, and males have bony protrusions on their heels called spurs, which look like spikes, can grow up to two inches in length, and make for gnarly weapons. Hunters refer to the birds as "cunning." Benjamin Franklin had it right when he argued that, while the eagle was a poor choice for the Great Seal as "a bird of bad moral character," the turkey, though "a little vain and silly," was "a bird of courage, and would not hesitate to attack a grenadier of the British Guard who should presume to invade his farm yard with a red coat on." In short: Turkeys are not to be messed with. Long an American underdog, turkeys are having a comeback. Millions roamed the United States, Canada, and Mexico when European colonists arrived, but turkey habitat disappeared as land was cleared for development. Furthermore, though there's no formal record of whether turkeys were eaten at the first Thanksgiving, they certainly became a dietary staple. Hundreds of years ago, according to Bruce Wurth, a hunter and member of the National Wild Turkey Federation, people would pull wagons underneath trees at night to shoot into roosts. Whatever fell in the wagon came home, and whatever fell outside it was left to rot. 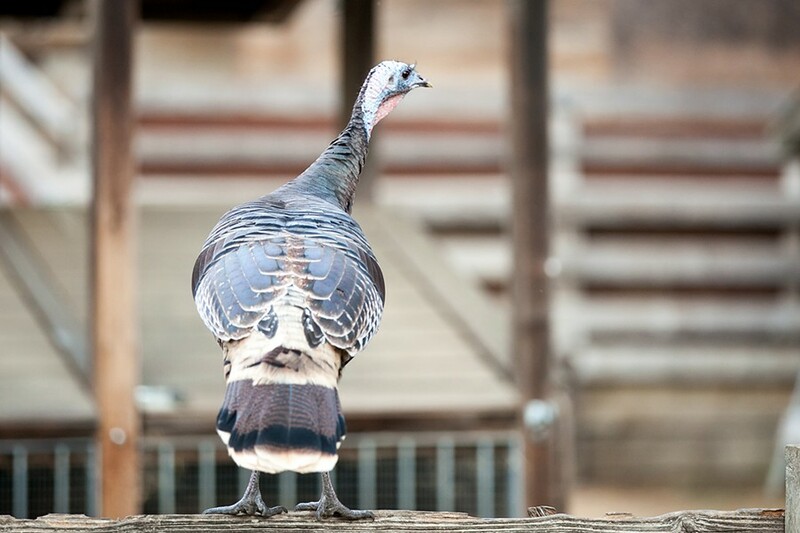 By the early 1900s, the turkey population nationwide had dwindled to about 30,000.